The complexity of social and economic policy problems of the 21st century, including the widening of inequality gaps both locally and globally, is strongly increasing. Many take this as a call to revise, in a nontrivial way, our conceptual outlooks, and to increase recognition of the role and importance of multi-sided reflection of theory and practice. The evolution of capitalism and the globalization of its various forms has contributed to unprecedented social, political, and environmental challenges. The global financial crisis of 2007-2008 made clear the need to redress and redesign both the global economy and economics as a discipline, to broadening the dialogue on social responsibility, and to develop a new culture of decision making. The long-standing debates regarding economic systems, criteria of economic and social justice, and which macroeconomic policies bring about the best possible outcomes are gaining currency; this leads to asking new questions concerning various aspects of the state and market relationships on national and transnational levels, and the relation between freedom and capital economy. A pluralist approach is needed, both practically and methodologically, for a better grasp of the historical development and conditions of both the current socio-economic system and our framing and perception of it in problem solving approaches. Pluralist Readings in Economics: Key-concepts and policy tools for the 21st century provides such conceptual openings in interdisciplinary engaged and accessible ways. In this eBook, Maria Alejandra Madi provides broad coverage of the topics through a careful selection of some of the influential economic thinkers, and offers a substantial literature overview that includes pointing the reader to the main tenets of the included authors’ ideas, context, and interpretations. Dealing with complex problems requires an ability to go beyond our received ideas and conceptualizations of the problems in question to redefine them in new contexts, and to dialoguing on social responsibility. Maria Alejandra Madi’s introductory work fits well with such end, preparing the reader for enlargement of the debate that aims to contribute to the transformation to a more just and sustainable economy and world. The book is recommended for a broad interdisciplinary audience, specifically to students in social sciences and humanities. It will benefit all those who seek to better understand the complex stakes in the transitions of the capitalist system, in the tensions between regulatory policies, free market equilibria, and participatory openings in governance. As John Kenneth Galbraith pointed out economics is overwhelmed by an ‘uncorrected obsolescence.’ The target of economics education is the comprehension of the reality in its economic dimension, that is to say, the understanding of those practices and ideas that support the evolution of material life and the provision of human needs. In the post-war period, economics was broadly understood as economic science, that is to say, as a specific area of the development of human knowledge. Today, the main challenge to economics as a discipline is to cope with changing economic realities. In the current setting, a pluralist approach to economics attempts to consider a broad scope of perspectives in order to apprehend the complexity of the real-world. These Pluralist Readings aim to foster the awareness of diversity of ideas within economic thought. Its scope involves broad topics in economics and debates about historical and theoretical approaches, besides policy matters. We examine the contribution of major thinkers in relation to their understanding of the historical development of capitalism, highlighting the writings of Karl Polanyi. Rudolf Hilferding and Eric Hobsbawm. Indeed, at the heart of modern political thought there is an ongoing debate about the main features and the outcomes of the capitalist system. Considering the power issues at stake in the capital accumulation process, relevant questions have emerged in the economic debate. At this respect, we include the writings of scientists who sharply analysed the conflicts and tensions within the economic capitalist system, including Karl Marx, Michal Kalecki and John Kenneth Galbraith. Significant contributions to monetary theory by Eugen von Böhm-Bawerk, John Maynard Keynes and James Tobin are also considered. Indeed, controversies about the role of money, interest rates and the banking system have been present in economic debates since the 18th century. Today, monetary issues continue to play an outstanding role in policy making. In addition, differing perspectives from economic thinking are presented on behalf of their insightful perspectives about the challenges for enhancing competition and price stability. In this attempt, Alfred Marshall, Joan Robinson and Milton Friedman’s contributions are considered. Some topics on theories of economic growth and business cycles are structured around great debates that have present in capitalist societies over the past 300 years. In this attempt, we include the contributions of Adam Smith, Joseph Schumpeter and Hyman Minsky around the outcomes of free markets, the role of technology and entrepreneurship and the impacts of the financial set-up on economic growth and cyclical business dynamics. In addition, controversies around the best way to organize economic activity—through government, through free markets or some combination of the two – have been always present in the economic debates. These issues are addressed by considering the writings of David Ricardo, John Maynard Keynes and Friedrich von Hayek - economists whose contributions to the economic policy debate have been outstanding in real-world economics. Finally, as concerns on welfare, justice and fairness have been closely intertwined in economic thought, we address these relevant topics by including the contributions of Arthur Pigou, Amartya Sen and Elinor Ostrom. We believe that the eBook will provide a space for reflection about economic issues that arise whenever one seeks to understand the complex process of evolution of the capitalist system. The systematic study of some of the most influential interpretations about the economic features and outcomes of the capitalist system certainly offers an excellent opportunity for humanists to deal with some of the central concerns of social scientists. The authors confirm that this chapter content has no conflict of interest. The author is thankful to the anonymous referees whose recommendations enhanced achieve substantial improvements in the final edition. “The study of economics does not seem to require any specialized gifts of an unusually high order. Is it not, intellectually regarded, a very easy subject compared with the higher branches of philosophy and pure science? Yet good, or even competent, economists are the rarest of birds. An easy subject at which very few excel! The paradox finds its explanation, perhaps, in that the master-economist must possess a rare combination of gifts. He must reach a high standard in several different directions and must combine talents not often found together. He must be mathematician, historian, statesman, philosopher - in some degree. He must understand symbols and speak in words. He must contemplate the particular in terms of the general, and touch abstract and concrete in the same flight of thought. He must study the present in the light of the past for the purposes of the future. No part of man's nature or his institutions must lie entirely outside his regard. He must be purposeful and disinterested in a simultaneous mood; as aloof and incorruptible as an artist, yet sometimes as near the earth as a politician”. 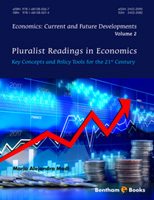 The second volume (titled Pluralist Readings in Economics: Key concepts and policy tools for the 21st century and authored by Maria Alejandra Madi) in the series of Economics: Current and Future Developments, covers a number of important economists, mostly contemporary or from the recent past but also from the classical period, some better known than others, representing a variety of approaches and themes of research, grouped around seven main subject areas: Karl Polanyi, Rudolf Hilferding and Eric Hobsbawm on the evolution of capitalism; Karl Marx, Michal Kalecki and John Kenneth Galbraith on capital, labour and power; Eugen von Böhm-Bawerk, Keynes and Tobin on money; Alfred Marshall, Joan Robinson, Milton Friedman on prices; Adam Smith, Joseph Schumpeter and Hyman Minsky on growth and economic cycles; David Ricardo, Friedrich von Hayek and Robert Mundell on economic policy; Arthur Cecil Pigou, Amartya Sen and Elinor Ostrom on welfare, social justice and governance. For each author there is a brief introduction setting the scene, a summary of the key concepts concerning the theme under consideration, some brief reading passages with the corresponding idea or concept highlighted, a brief note on the current relevance of the ideas presented, suggestions for further readings. Clearly, all this is very useful: not only for the beginner, but also for the experienced economist who nowadays tends to be focused on a very specific area of research, hence in need of being confronted, once again or for the first time, with important themes and authors. Space constraints of course implies hard choices, so that each reader may feel he or she would have preferred a different choice of authors, of passages, of references; but it seems to me that the choices made are reasonable ones and can be justified. Consistent with the pluralist approach, there is also no attempt to a critical reading of the theoretical contributions of the various authors, while more freedom of judgment is retained in the policy comments. This excellent book, Volume 2 in the series, Economics: Current and Future Developments, Pluralist Readings in Economics: Key concepts and policy tools for the 21st century, provides a comprehensive introduction to multiple views on seven fundamental topics in the history of economics. The seven topics and chapters are: The Evolution of Capitalism; Capital, Labour and Power; Money; Prices; Growth and Economic Cycles; Economic Policy; and Welfare, Social Justice and Governance. Each chapter reviews the thinking of three major figures in the history of economics, so that the thinking of a total of twenty-one key figures is effectively and informatively reviewed. For example, the Evolution of Capitalism chapter reviews Karl Polanyi, Rudolph Hilferding, and Eric Hobsbawm; the Prices chapter reviews Alfred Marshall, Joan Robinson, and Milton Friedman; and the Welfare, Social Justice and Governance chapter reviews Arthur Pigou, Amartya Sen, and Elinor Ostrom. The book is also clearly organized with each chapter having the same five subsections – Setting the Scene, Key Concepts, Reading Passages, Modern Concepts, and Further Reading – to allow comparisons of different figures approaches to the same topics and links to contemporary thinking. Thus, the book could stand alone in teaching and for advanced students new to the history of economics, or provide a core text to be supplemented with additional readings from more specialized literatures. A special strength of the book is its pluralist character. The goal of the book is not to review only figures who shared the same views, as is sometimes the case in heterodox volumes devoted to only one approach. Rather the different figures reviewed often have significantly different views and approaches, which gives readers the opportunity to reflect on the basic issues in each chapter. The book is strongly recommended as an introduction to economics, and would no doubt provide valuable foundations for advanced study in economics. In our view, the book succeeds in providing, in the author’s words, “a pluralist intellectual path, through the historical evolution of economic ideas, to enhance a deeper understanding of current social, political and economic relations”. This goal is achieved also by organizing the analysis of each economist considered in the following paragraphs: Setting the Scene, Key Concepts, Reading Passages, Modern Concerns on the issues addressed, Further Reading. This layout provides a good synergy between the historical, analytical, and contemporary perspectives of the themes addressed. Other interesting aspects of the book can be found in (i) the application of a pluralist methodology aimed at comparing the often notable different approaches of orthodox and heterodox economists; and (ii) in the effort to consider the various themes as different aspects of the problems and contradictions of modern economic systems. For these reasons, the book can be used both as a textbook at intermediate and advanced level, and as an intellectual tool for steering a more complex reflection and debate on major economic issues. Drawing on the work of earlier economists, Madi highlights the range of perspectives that have been, and can be, taken to understand the workings of the economy, its interactions with politics and its place in society. She shows how these older perspectives are highly relevant today, despite the lack of attention given to them in current mainstream courses. Her approach includes the choice of selected extracts from the works of the chosen economists and adding brief interpretation and applications. Madi stresses the importance of change and evolution of economic systems and the way that people and institutions adapt, including the significance of globalisation at the current time. Many of these aspects are hidden or lost in current mainstream economics. Overall, the book opens up a wealth of literature for students and shows how this can be applied in today’s world. It shows the value of diverse perspectives and illustrates some of the omissions in a monolithic mainstream approach. The book does not restrict itself to economists from the English speaking world. Broader approaches are still acceptable and debated in some of those circles, notably in Latin America, but the literature is generally not so accessible to Anglophone scholars. This introduction is likely to encourage students to explore further among this wider range of ideas. Department of Economics and Finance, Massey University, New Zealand.